It’s that time of year where we all have courgettes coming out of our ears. Even if you aren’t growing your own, then you may be getting cast offs from friends, neighbours or colleagues. Amy and I joke when we are travelling together, I’m gluten intolerant, she’s vegan, so finding somewhere Steph-and-Amy-friendly can be challenging, we did amazingly well in Prague and I’m always looking for recipes I can make for us both. I have a willing taster in my colleague and friend Selina, so even when Amy and I are 400 miles apart, we can share the same tastes and flavours and have a virtual cup of tea. 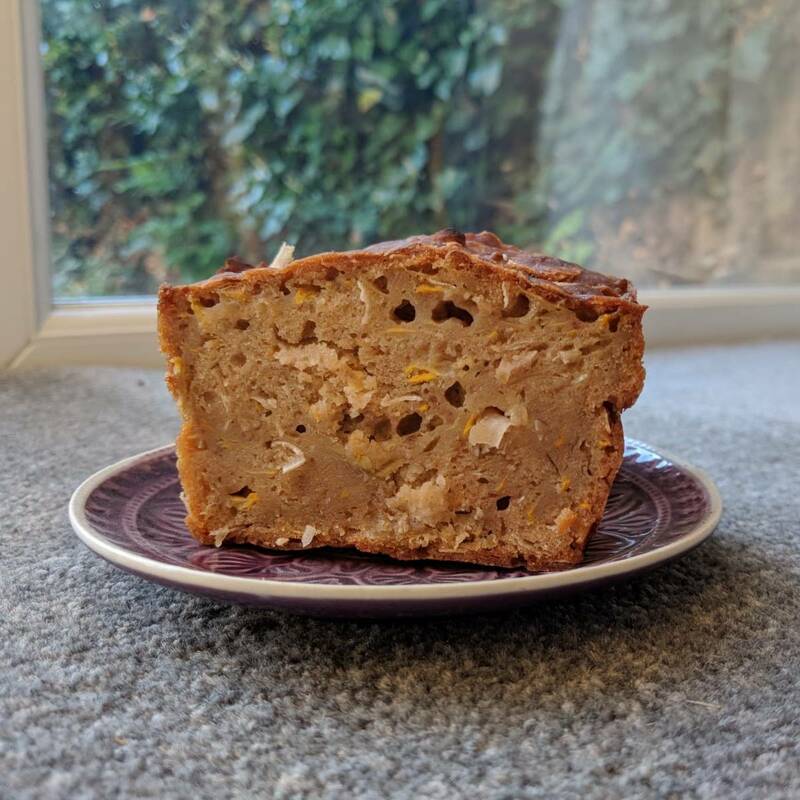 I am happy to say that this coconut courgette loaf cake* is Steph and Amy friendly, as well as nut free. 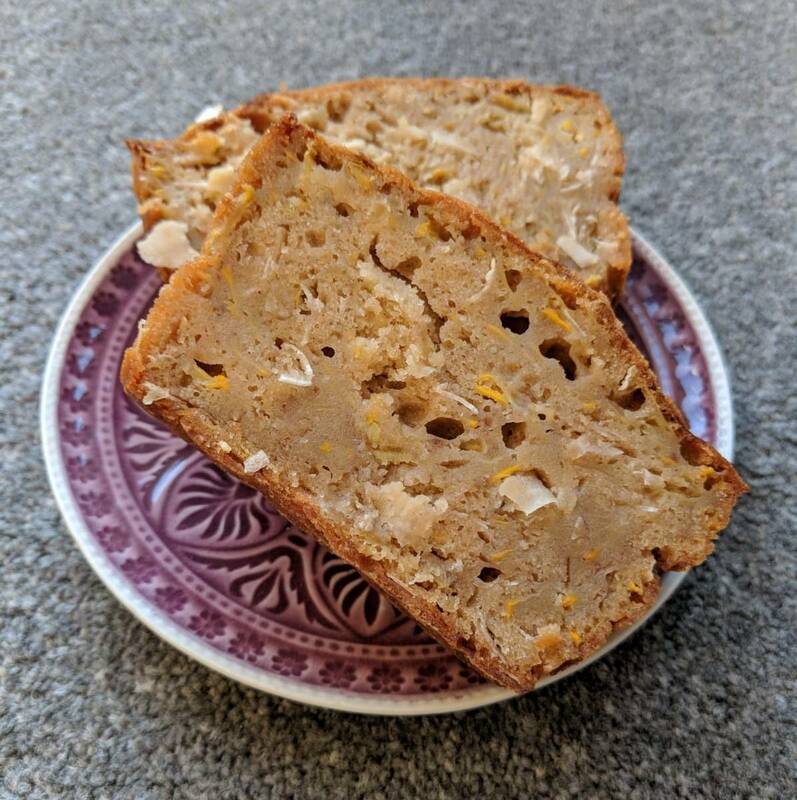 Save those summer courgettes from turning into marrows and make this loaf, it’s the kind of loaf-y cake you can have after dinner with a dollop of something sweet, or for breakfast with nut butter and sliced banana. It works in the afternoon with a cup of tea and with only 100g of sugar in the whole lot, you can just keep tucking in. I also have loads of blackberries, so expect some blackberry recipes soon! NB: swap the chickpea flour at your peril! You can find large bags in the ethnic aisle in your local supermarket, small packets in the specialty or GF flour section. 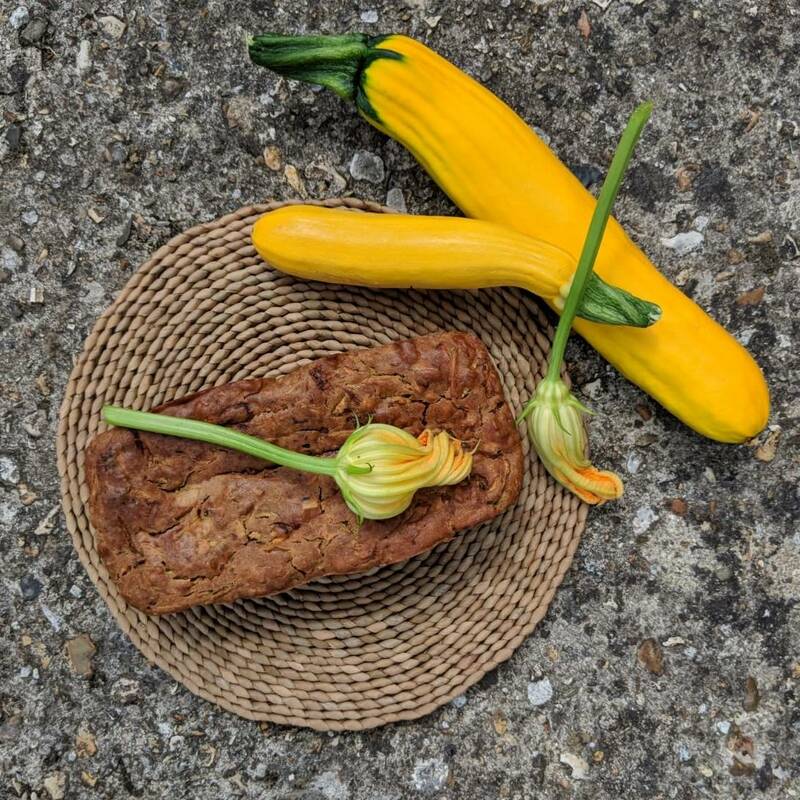 It’s super absorbent and soaks up all the excess moisture from your courgettes, it may go a little gooey, that’s okay. The gram flour stops too much liquid ruining your loaf and means we can squeeze more courgette in! 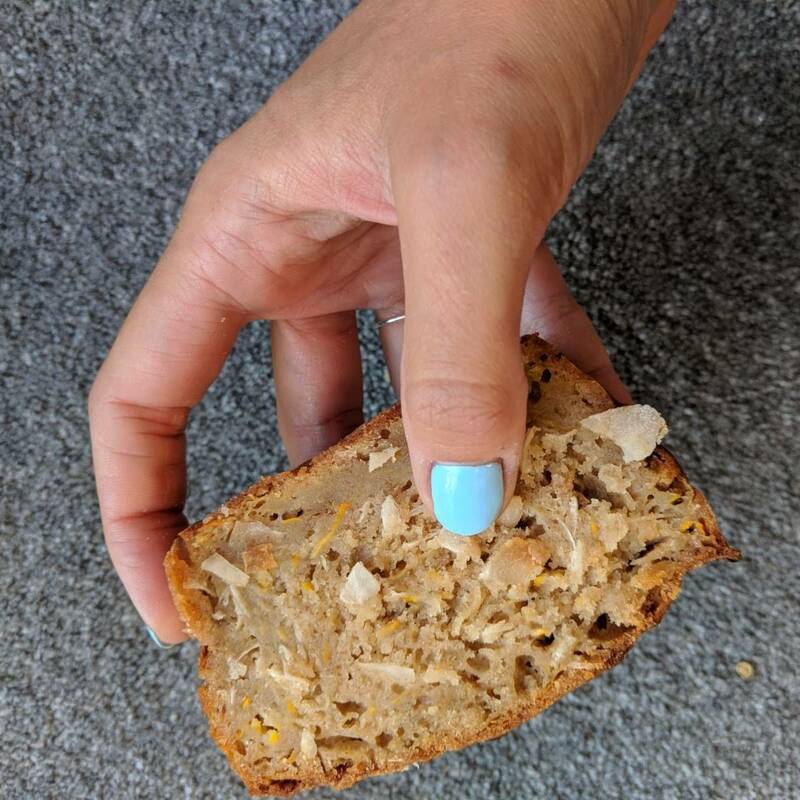 Grease a 9×5 loaf pan with coconut oil and set it aside. Or use a silicone loaf tin for ease! In a large bowl, whisk together the flour, sugar, coconut flakes, cinnamon and salt. In a jug, stir together the coconut milk, vanilla and orange extracts. Add the coconut milk to the dry ingredients and stir, then begin to stir in the melted coconut oil. Grate your courgette into a separate bowl, then dust the courgette with the gram flour, stirring as you go. it will go sticky and gooey, see notes above. Stir the floury courgette into the cake mix and pour the batter into the prepared tin. Bake in the centre of the oven for 65 to 75 minutes, check at 45 and 60 minutes, if the top begins to brown too much, cover the top with foil. Before taking out the oven check the middle with a skewer and ensure it comes out clean. Leave in the tin for 30 minutes before moving to a cooling rack to cool completely, it’s too moist to eat hot at this point! It may sink slightly in the center once cool, even if is cooked the entire way through. Let us know if you try the recipe! Previous Post Sweat in August, Edinburgh Fringe Festival edition!